Even without making allowances for the composer’s remarkable youth, Mozart’s music for the first part of Die Schuldigkeit des ersten Gebots is highly accomplished, full of descriptive flair and artistry. The allegorical figures of Barmherzigkeit and Gerechtigkeit are clearly differentiated, the former’s sympathetic compassion contrasting with the latter’s more matronly severity, while Weltgeist’s carefree hedonism is given full reign in arias of considerable virtuosity and difficulty. The orchestra plays an important role, with string textures frequently enriched by the use of two separate viola parts (a device that Mozart was soon to re-employ in Apollo et Hyacinthus), and the instrumentation is more adventurous than anything Mozart had previously attempted. In addition to the standard orchestra of strings, harpsichord, oboes, horns and bassoons, Mozart employs two flutes for Weltgeist’s second aria, in which deliberately static and formulaic harmonies wittily underline her castigation of Christgeist‘s pomposity and lack of imagination, while in Der Christ’s soulful aria, “Jener Donnerworte Kraft”, a solo alto trombone is tellingly employed to represent the Last Trumpet (in German this has always been translated from the Bible’s original Hebrew as a trombone rather than a trumpet)—in his final months Mozart was to use a solo trombone similarly in the ‘Tuba mirum’ of his Requiem. If the word-painting is at times a little obvious it is also remarkably assured. At the start of the opening aria first violins and then viola, cello and bass weave a chromatically falling figure to match Christgeist’s disconsolate description of godless souls falling towards Hell, and in the middle section of the same aria scurrying strings evoke the ‘rivers that burst their banks’. Likewise in the following aria, snarling horns and menacing string configurations playfully characterise an enraged lion which prowls through the forest. Most remarkable and progressive of all, perhaps, are the orchestrally accompanied recitatives, whose vivid depictions of Der Christ’s nightmare visions already anticipate the marvels of Idomeneo or Così fan tutte. 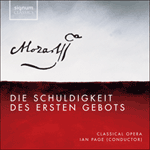 But to compare the technique, skill and inspiration of Die Schuldigkeit des ersten Gebots with the glories of Mozart’s maturity is to miss the point. This first foray into extended dramatic composition offers fascinating insights into the genesis and development of arguably the greatest opera composer ever to have lived, as well as providing an extraordinary monument to childhood. It is regrettable that the contributions of Michael Haydn and Adlgasser have not survived, if only because it deprives us of an intriguing point of comparison, but they would surely have struggled to outstrip the quality, beauty and dramatic understanding which already characterize the work of their eleven-year-old colleague. Selbst wenn man Mozarts Alter zum Zeitpunkt der Komposition außer Acht ließe, ware die Musik der Schuldigkeit des ersten Gebots bemerkenswert. Die sehr unterschiedlichen allegorischen Charaktere der Barmherzigkeit und Gerechtigkeit sind musikalisch voneinander abgesetzt; Verständnis und Mitgefühl der Barmherzigkeit stehen in Kontrast zur erzieherischen Strenge der Gerechtigkeit, und die unbeschwerten Ausschweifungen des Weltgeists sind musikalisch in Arien höchster Virtuosität gemalt. Dem Orchester kommt eine wichtige Rolle zu, und Mozart sättigt den Klang, indem er eine zweite, separate Bratschenstimme schreibt, so wie er es auch wenig später in Apollo et Hyacinthus machen sollte. Der Einsatz der Instrumente übersteigt bei weitem Mozarts früheren Versuche für Orchester. Zu dem normalen Orchester bestehend aus Streichern, Cembalo, Oboen, Hörnern und Fagotten fügt Mozart in der zweiten Arie des Weltgeists noch zwei Flöten hinzu. Hier setzt Mozart ausserdem gezielt statische und wenig einfallsreiche Harmonien ein, mit denen er des Weltgeists Hohn über des Christgeists Wichtigtuerei und mangelnden Einfallsreichtum zum Ausdruck bringt. In des lauen Christs beseelter Arie “Jener Donnerworte Kraft” ertönt die Posaune des höchsten Gerichts in Form einer obligaten Posaunenstimme. Hier erscheint also schon ein Vorgeschmack auf Mozarts einschlägigen Einsatz der Posaune im “Tuba mirum” seines Requiems. Mozarts musikalische Sinnbilder sind zwar an einigen Stellen flach, aber sie zeigen trotzdem schon seine Sicherheit in der Charakterdarstellung. So zum Beispiel zu Beginn der ersten Arie, in der die ersten Geigen gefolgt von den Bratschen, Celli und Kontrabässen sich zu einer chromatisch absteigenden Figur verbinden, um des Christgeists Beschreibung der götterlosen Seelen zu untermalen, wie sie in der Hölle versinken. Im Mittelteil dieser Arie sind es wieder die Streicher die mit schnellen Bewegungen das Bild der Flüsse malen, die über ihre Ufer treten. In der darauffolgenden Arie malen die grollenden Hörner und die bedrohlichen Streichersechzehntelpassagen den wütenden Löwen wie er durch das Dunkel des Waldes streicht. Am bemerkenswertesten sind die vom Orchester begleiteten Rezitative, deren lebhafte Untermalung des Albtraums, der den lauen Christen zu Beginn heimsucht, schon auf Mozarts spätere Opern Idomeneo und Cosi fan tutte hindeutet. Wenn man jedoch Mozarts Techniken, Fähigkeiten und die Inspiration für die Schuldigkeit des ersten Gebots nur mit seinen reifen Werken vergleicht, verliert man das Wichtigste aus den Augen. Denn dieser erste Ausflug in die Welt der dramatischen Kompositionen gibt nicht nur einen Einblick in den Werdegang des vielleicht größten Opernkomponisten, sondern stellt ganz für sich ein außergewöhnliches Monument an die Kindheit dar. Es ist umso mehr zu bedauern, dass die Musiken von Michael Haydn und Adlgasser verschollen sind, die hier interessante Kontraste geboten hätten. Sicherlich hätten auch diese Werke nur schwer die Qualität, Schönheit und das dramatische Verständnis übertreffen können, die ihr elf Jahre alter Kollege hier schon an den Tag legte. The setting is a pleasant area with a garden and a small wood. In a shrubbery lies a half-hearted Christian (Der Christ). He is fast asleep, and three allegorical figures—The Spirit of Christianity (Der Christgeist), Divine Justice (Gerechtigkeit) and Divine Mercy (Barmherzigkeit)—are discussing his predicament. Christianity pleads on behalf of the sleeping man, begging Justice and Mercy to save mankind from spiritual inertia. They are sympathetic to his plea, but point out that neither of them can be of help if mankind continues along this indolent path. Christianity argues that a vivid warning of infernal damnation might shock the half-hearted Christian into recognising the error of his ways. Justice agrees, and wakes up the sleeping man by presenting to him in a dream a nightmarish vision of his Day of Judgement. Justice and Mercy now retire to the heavens, and Christianity observes from a hiding place as the Christian awakens and contemplates the terrifying voice that he has heard in his sleep. The Spirit of Worldliness (Der Weltgeist) now arrives, though, and urges the Christian to forget about his dream and to follow her pleasure-seeking philosophies. The Christian is partially comforted, but still feels troubled by his dream. Worldliness concludes that the Christian’s dream must have been a trick played by her arch-enemy, whom she denounces as a sanctimonious killjoy. Unable to contain himself any longer, Christianity now appears disguised as a doctor and engages in conversation with the Christian, who is eager for advice and treatment. Worldliness becomes bored by their conversation and withdraws to prepare breakfast, enabling the doctor to set about his task of offering the Christian a cure. The Christian is amazed to learn that the doctor already knows of his dream, and accepts the medicine that he is offered. Just as the doctor seems to be making significant progress, however, Worldliness returns to invite the Christian to a breakfast party. The Christian makes his excuses to the doctor, but promises to try the medicine. Mercy and Justice now return. They insist that they cannot help this man if he is unable to help himself, but Christianity asks for more time. He is now hopeful and confident that he can convert this lost soul, thereby increasing the fame and lustre of both Mercy and Justice. Although the music has been lost for Michael Haydn and Anton Adlgasser’s second and third parts of Die Schuldigkeit des ersten Gebots, the libretto has survived. In Part Two, Worldliness tries unsuccessfully to persuade the half-hearted Christian to kill a thief who has stolen both his money and his beloved. Christianity, meanwhile, has returned disguised as a gardener, and the gardening imagery is sustained as Justice and Mercy compare the Christian to a tree which, though in full leaf, is barren. Justice advocates cutting the tree down, but Mercy persuades her that they should prune the old branches to enable the tree to bear new fruit. In Part Three, the Christian emerges full of contrition, humility and zeal. He is easily able to repel the final temptations of Worldliness, who is eventually driven away by Christianity, and the remaining characters unite in praise of their Creator. Der Ort der Vorstellung ist “eine anmutige Gegend an einem Garten und kleinen Wald.” In einem Blumengesträuche liegt schlafend der laue Christ. Drei allegorische Figuren—Christgeist, göttliche Barmherzigkeit und göttliche Gerechtigkeit—diskutieren seine Lage. Der Christgeist setzt sich für den Schlafenden ein, dass Barmherzigkeit und Gerechtigkeit doch die Menschheit vor ihrem eigenen trägen Geist bewahre. Obwohl die Beiden seiner Bitte zuhören, weisen sie ihn doch darauf hin, dass keiner von ihnen etwas auszurichten vermag, wenn die Menschheit weiterhin betört vom Blendwerk des Weltgeistes zum offenen Höllenschlund läuft. Der Christgeist zieht in Erwägung, ob vielleicht eine Warnung in Form eine farbenprächtige Darstellung der ewigen Verdammnis den lauen Christen auf seine Blindheit aufmerksam zu machen vermöge, und so sucht Gerechtigkeit den Schlafenden mit einer albtraumartigen Vision des Tags des jüngsten Gerichts heim. Nach diesem Werk ziehen Gerechtigkeit und Barmherzigkeit sich in den Himmel zurück, und der Christgeist beobachtet aus einem Versteck hervor, wie der laue Christ aufgerüttelt von den bedrohlichen Donnerworten seines Traumes erwacht. Just in diesem Moment erscheint jedoch der Weltgeist und bedrängt den lauen Christen, doch seinen Traum zu vergessen und ihm in die Wollust zu folgen. Obwohl er den lauen Christen hiermit beruhigen kann, lässt diesen doch sein Traum nicht los. Der Weltgeist schließt mit der Folgerung, dass des lauen Christen Traum nur ein Trick seines Erzfeindes gewesen sei, der—ein kleinlicher Mückenfänger—niemandem eine Freude gönne. Unfähig länger untätig zuzusehen, erscheint der Christgeist getarnt als Arzt und verwickelt den lauen Christen in ein Gespräch, was ihm nicht weiter schwer fällt, da der laue Christ guten Rat und Hilfe sucht. Der Weltgeist ist vom Gespräch der Beiden so gelangweilt, dass er sich zurückzieht, ein Frühstück vorzubereiten und so dem Doktor freie Bahn lässt, dem lauen Christen seine Heilung anzubieten. Der laue Christ ist nicht wenig überrascht, dass der Arzt seinen Traum kennt und akzeptiert daher umso schneller seine Medizin. Als der Doktor sich also gerade auf dem richtigen Wege wähnt, kehrt jedoch der Weltgeist zurück, um den lauen Christen wie vorangekündigt zu seinem Frühstücksmahl zu führen. Der laue Christ verabschiedet sich vom Doktor mit dem Versprechen, seine Medizin zu probieren. Barmherzigkeit und Gerechtigkeit kehren zurück. Sie wiederholen ihre Klagen, dass sie diesem Mann nicht weiter helfen können, wenn er sich nicht selber helfen will, aber der Christgeist erbittet sich noch ein wenig mehr Zeit. Er ist zuversichtlich, dass er die verlorene Seele bekehren und damit den beiden, Barmherzigkeit und Gerechtigkeit, Ruhm und Ehre erweisen kann. Die Musik zu den Teilen zwei und drei der Schuldigkeit des ersten Gebots, komponiert von Michael Haydn und Anton Adlgasser, ist zwar verschollen, das Libretto ist jedoch erhalten. In Teil zwei versucht der Weltgeist erfolglos den lauen Christen davon zu überzeugen, dass er einen Dieb ermorden soll, der ihm sowohl sein Geld wie auch seine Geliebte genommen hat. Der Christgeist erscheint diesmal als Gärtner. Barmherzigkeit und Gerechtigkeit greifen dieses Bildnis in ihrem nächsten Gespräch metaphorisch auf, indem sie den lauen Christen mit einem Baum vergleichen, der zwar üppiges Laub aber keine Früchte trägt. Die Gerechtigkeit spricht sich dafür aus, den Baum zu fällen, aber die Barmherzigkeit überzeugt sie, dass sie doch die alten Äste zurückschneiden sollten, um dem Baum noch eine letzte Chance zu geben, Früchte zu tragen. Im dritten Teil erscheint der Christ in neu-gefundener Reue, Demut und Strebsamkeit. Nun scheint es ihm ein Leichtes, den Versuchungen des Weltgeistes zu widerstehen und der Weltgeist muß sich schließlich vor dem Christgeist trollen. Die anderen Protagonisten vereinen sich zu einem Gesang an den Schöpfer. so wie es ihr gefällt. Barmherzigkeit: Was je erwartest du? Barmherzigkeit: Und was bekümmert dich so sehr? bestow, if it so pleases Him. Divine Mercy: What exactly are you expecting? Divine Mercy: And what distresses you so much? flower-strewn street into the open jaws of Hell. abducts whole hordes of people. nicht Heil, nicht Rettung schafft. reißt nach den tausend hin. does not bring salvation and deliverance. sweep them away by the thousand. daß sie zu Grunde gehn. gleich einer Last zu sein. mithin auch höchster Liebe wert? gilt viel mehr als Gottes Wort. noch Himmel, Hölle, Tod und Richter. für sie kein Mittel finden. nurtures and eternally rewards them? and therefore deserving of the most supreme love? for much more than God’s word. rings herum nach Raube sieht. achtet Schutz und Helfer nicht. and looks all around for prey. and spurns any protection or help. sein Eigensinn sei Schuld daran? be lamented with much sorrow? that his obstinacy was to blame for it? as if they were numbed. die Wissenschaft des Heils zu lehren. in ihre lauen Herzen gehen. Barmherzigkeit: Wohlan, es soll nach deinem Wunsch geschehen. der Auserwählten Zahl zu mehren. der führt zum weiten Höllenrachen. aus seinem Schlummer möcht’ erwecken! through the voice of their teachers. be fired into their lazy hearts. Divine Mercy: Alright, your wish shall come to fruition. to increasing the number of the chosen. which leads to the open jaws of Hell. has plunged into a deep sleep. to toil, industry and labour. and await a severe judgement. to the Lord your God! Barmherzigkeit: Er scheinet zu erwachen. ob meine Wort’ erwünschte Wirkung machen. Barmherzigkeit und Gerechtigkeit begeben sich auf den Wolken von hinnen. Christgeist: Ich will das Beste hoffen. Divine Mercy: He seems to be waking up. whether my words produce the desired effect. Mercy and Justice depart on clouds. Christianity: I’ll hope for the best. Der Christ: Wie, wer erwecket mich? Weltgeist: Was Rechenschaft? was Tod? was Hölle? was sollen diese Grillen sein? Der Christ: Freund! wie erwünschlich triffst du ein! Nun hört er meinen Feind, o Ungelücke! Der Christ: Ach Trost, ach Rat in meiner Seelennot! ein buntes Nichts, ein Schattenwerk. dir gedenken soll. Verläßt dich deine Witz? Bist du denn außer dir? Gewiß, du bist Verwirrung voll. erschröcket dich, betöret dein Gemüte. The Christian: What’s going on, who woke me up? I can’t see anyone here. Was it real or a trick? Worldliness: What judgement, what death, what hell? The Christian: Friend, how opportunely you arrive! Now he’s listening to my adversary, oh misfortune! The Christian: Ah, bring me comfort and counsel in my soul’s distress! a gaudy nothing, an empty shadow. and put aside all concern. think of you now. Have you lost your wits? terrifies you and bewitches your mind. to trust in me than in dreams. räume sich der Wollust ein. and let dreams be dreams. und die ein bloßer Traum unmöglich könnte sein. denn, sie noch hörend, wacht’ ich auf! ich spüre fast nur halbes Leben. have been a mere dream. for I woke up still hearing them! and makes my trembling body shudder. I feel as if I’m only half alive. the sound of the Last Trumpet. zu keiner Zeit vergessen kann. da ich noch ihn, noch seinen Namen kenne? Ist’s möglich, daß ich länger schweige? er ist von ganz besondrer Art. so muß ich mich verstalten. from tormenting you and me. for I know neither him nor his name? but don’t make me name him. I point out to you his true nature. are nothing but priests’ mumbo-jumbo. he’s a completely peculiar sort. and for that reason she hates you! so I must disguise myself. das nur ihm alleine gleicht. an image which resembles him alone. Weltgeist: Wen hör’ ich nun hier in der Nähe? hier im Gebüsche sich verhüllte. noch viele Jahr gesund erhalten kann. Weltgeist: Sieh da, er geht bedachtsam hier vorbei. Ist deine Wissenschaft vielleicht die Arzenei? Gesunde weiß ich zu erhalten. vergnügt, gesund, gemächlich zu eralten. Ach, daß der Tod nicht gar vermeidlich ist! Wie gerne wollt’ ich dich belohnen! jedoch sehr Vieles liegt bei dir. die allgemach zum Frühstück ruft. Du wirst darauf ja nicht vergessen? Der Christ: Geh’ hin, dassel be zu bereiten. wird alles Kummers ihn befreien. nun kann ich freier mich erklären. zu folgen meinem treuen Rat? mein Aug’ erkältet und verderbt? Du irrest dich, an beiden fehlt mir nicht. der kürzlich mir das Herze machte beben. je mehr hat er zu sorgen. Worldliness: Whom do I now hear close by? hid himself here in the bushes. looking for tried and tested herbs here. for many a year in good health. Worldliness: Look there, he’s going past lost in thought. is your profession perhaps medicine? and know how to maintain good health. old enjoyably, healthily and unhurriedly. Alas that death is not altogether avoidable! which torment me far more than any illness. How gladly I’d reward you! but very much relies on you. You won’t forget about it? The Christian: Run along and prepare it. with all haste and best diligence. of escorting you to it. would release him from all his worries. now I can explain myself more freely. My breast and eyesight chilled and damaged? You’re mistaken. Both are untarnished. which recently made my heart shudder. the more he has to worry about. erstlich Messer, Scher’ und Glut. war dir nötig, war dir gut. before it can be healed by medicine. was necessary for you, was good for you. was soll ich wohl von ihm gedenken? dem keines aus all’ andern gleicht. Der Christ: Ist es vielleicht sehr hart zu nehmen? dem ist es lieblich, süß und leicht. Der Christ: Und was ist dessen Eigenschaft? für Schwindel in dem Haupt. von beiderlei Geschlechte erwarten dich. der Wohlstand heißt mich eilend gehen. so lohn’ ich dich bei unserm Wiedersehen. Man eilt, man lauft, wohin? that no other can rival. The Christian: Is it perhaps very hard to take? to it seriously it is delightful, sweet and easy. The Christian: And what is its distinctive quality? for dizziness in the head. of both sexes awaits you! my state of well-being demands me to hurry off. then I’ll repay you when I next see you. cuts short the progress of the soul. People hurry, and run, but where to? who cuts short all that is good. wer ist wohl endlich schuld? doch habt mit ihm Geduld. sogleich von Gottes Liebe brennen? den Schein der Hoffnung zu erkennen. bleibt doch dem Höchsten Lob und Preis. so dient er wenigst mir zur Ehre. who is really to blame ultimately? but have patience with him. immediately be ablaze with God’s love? to detect a glimmer of hope for him. and glory will always be due to the Almighty. then at least to me he will serve honour. so erhol’ ich neuen Mut. wenn der Mensch das Seine tut. dies soll mein Geschäfte sein. so that I can gain new courage. if man does his duty. this shall be my task.